And so...the "Bat-strat" concept was hatched. 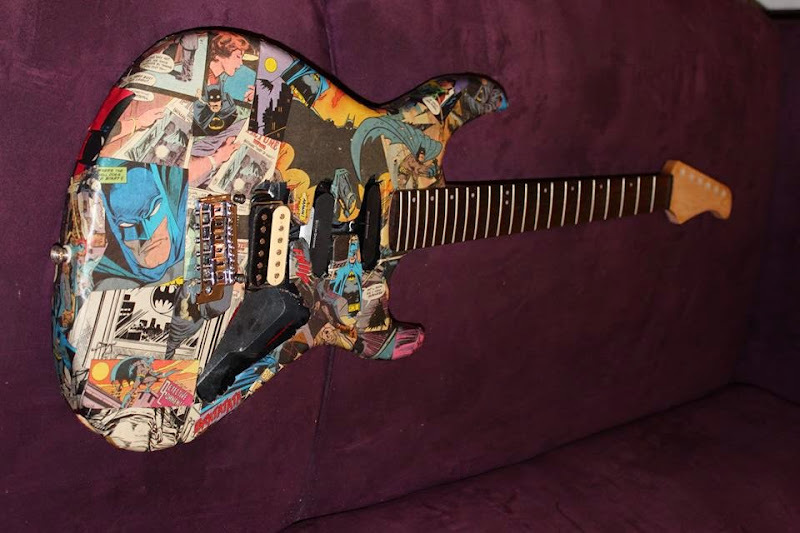 Take the guitar, cover it in a modge-podge of batman/detective comics, fit some decent pups and see what happens! 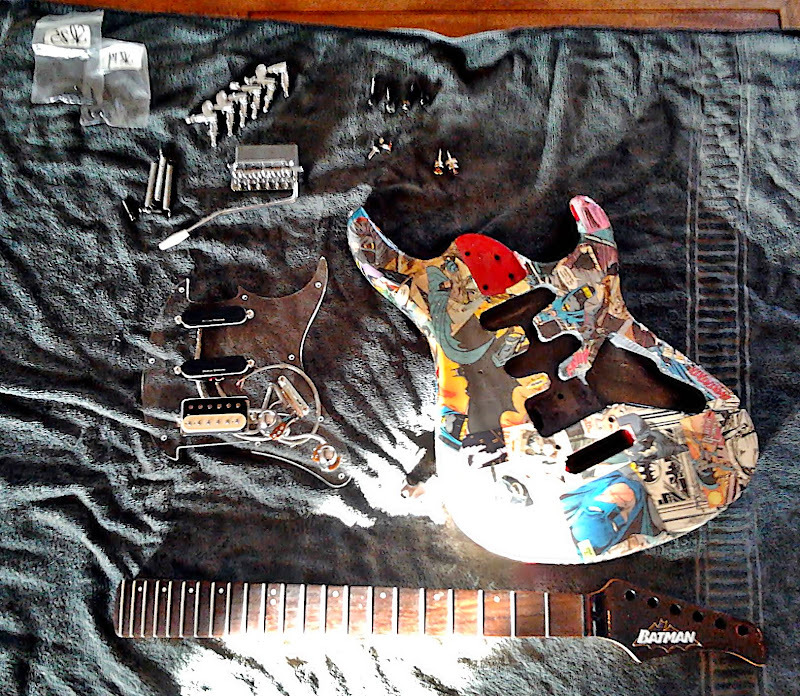 I got the parts together, dug into my comics collection for some battered 80's batman/detective comics, decided on a HSS (Tonerider generator + two hot seymour duncan designed singles) instead of the G200's SSS config, had a transparent plexiglass pickguard cut and scrounged a few other bits here and there. But a last minute contract appeared in Jozi so I handed it off to Ollie, who roped in his lady and friend to arrange and design...and I'm so glad that I didn't try it meself, they did a wikked job! That is such a cool idea, nice one! Do you now spray a few clear coats over it? shaundtsl wrote: Do you now spray a few clear coats over it? 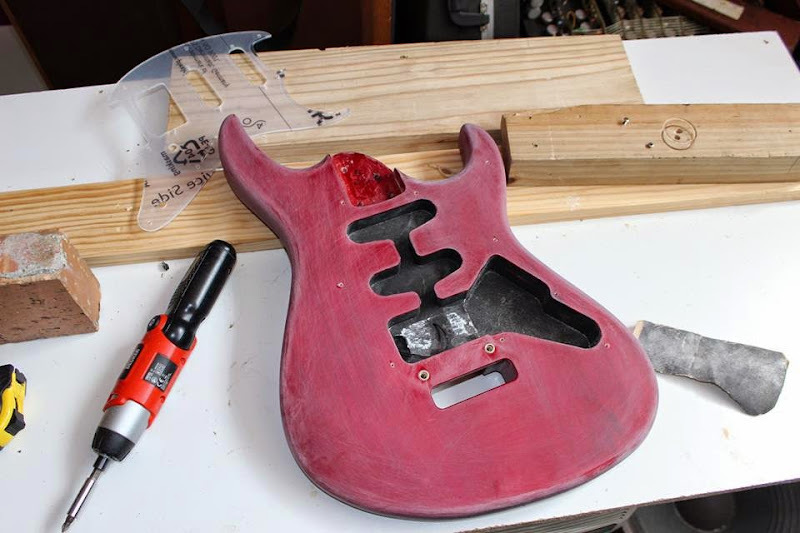 I'm not 100% sure, it's all in very Ollie's capable hands...I think he will clear it - he reckons there a few gaps in podge-work to cover still and the headstock, which he was thinking of going with a black background, batman logo and then a clear coat. I'm quite keen to see how it looks with transparent pickguard & pups installed, perhaps a steampunk vibe with the pots/wiring/etc exposed? And then how will the pups sound...the neck SC is a 12.7k monster (origins unknown)! Wizard wrote: That is beautiful! :roflmao: I nearly choked on my bunny chow! I would do one thing, if the wiring is going to be exposed there is not going to be much to see through the clear scratch plate and I fear that large black hole/section is going to stand out. Why not podge that section as well? Come to think of it, I have an old epiphone strat neck somewhere that would be perfect for that guitar... let me know if you want it. The headstock looks exactly like this, http://www.kijiji.ca/v-guitar/woodstock-on/epiphone-gibson-fat-210-stratocaster-guitar/1025628680 but the nut is missing if I recall correctly. Super duper coool as my son would say !! And the head stock too ! Go big with the podge ! We were bandying about the idea of backlighting up the interior (errr...bat signal!) with a few led's - no idea if that's still an option. Podging the interior & tremelo would be a great finishing touch, but it's all in Ollie's hands - so we'll see...Since there isn't a deadline on this one, I might be back in Cpt in time to help finish it off. Thanks for the offer Chris! That is a reaaalll funky looking head stock! We'll stick to the original for now, the guit was virtually unplayed when I got it and was should setup real sweetly (under the costume it's a stock G200, Ollie has setup a few before - they all came out very, very playable)...But we did think of doing a "Super Strat" next, so I'll be PM'íng ya - thanks again! Stick a recording of the Joker's laugh and possibly the old "nananana Batman!" 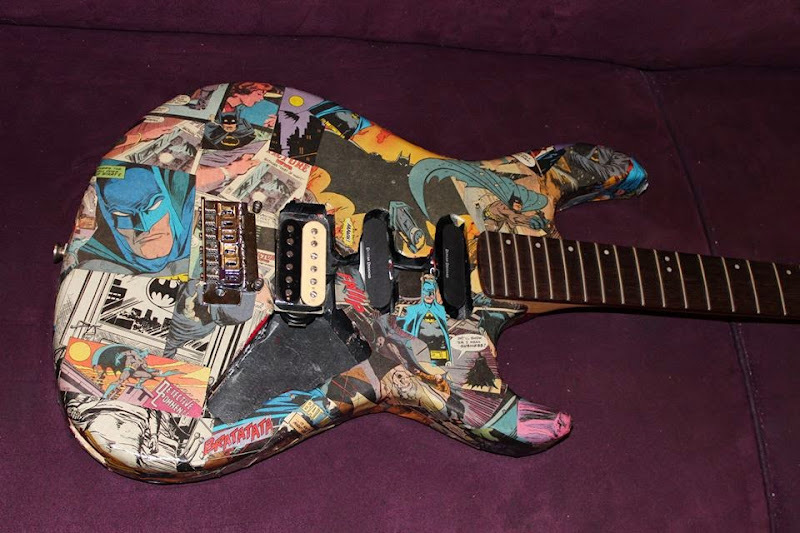 theme song in with the bat signal like that old limited edition Joker guitar. Every time you press the button the joker laugh plays through the signal chain and the bat signal lights up! Chocklit_Thunda wrote: Stick a recording of the Joker's laugh and possibly the old "nananana Batman!" theme song in with the bat signal like that old limited edition Joker guitar. Every time you press the button the joker laugh plays through the signal chain and the bat signal lights up! It's hardly a original idea, though I havn't seen one quite like we're intending. 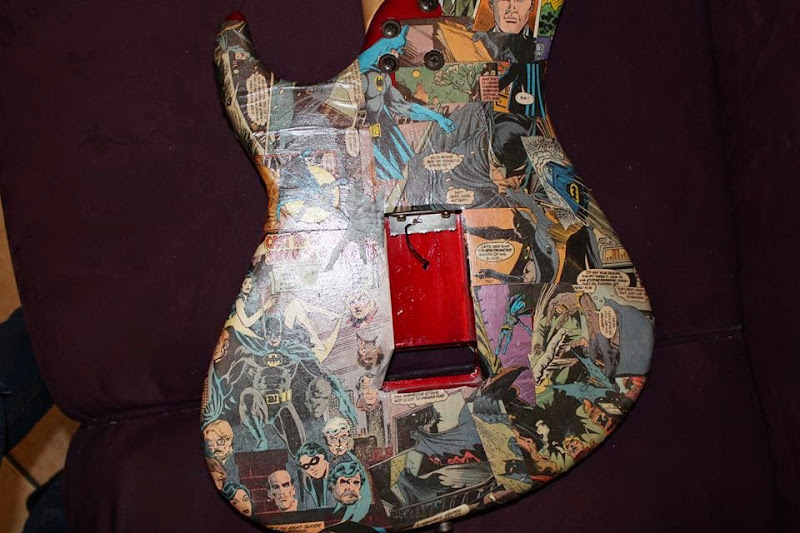 There was a super neat batman P-bass someone did a similar vibe on, they really did a amazing job...literally custom shop result, we're aiming more garage-caster. Yes, three comics were sacrificed, a early 80's batman and two late-80's detectives...I did look around for some more suitable ones, but -all of a sudden- back issues are bloody hard to find. So I trawled my small collection (+/- 500 batman/detective) for zero-value ones (v.poor condition) that I either had duplicates or they weren't worth re-re-re-reading - there were others that would have looked better, but they had some inherent value (storyline/rarity/condition/etc). Yeah, we could have printed out some legit looking images, but I wanted authentic comics. Hold on stop everything where is this death of superman issue?? I will pay goooooood money for it! ??? Chocklit_Thunda wrote: Hold on stop everything where is this death of superman issue?? I will pay goooooood money for it! ??? Wow super duper delicious extra cool idea !!! Chocklit_Thunda wrote: Stick a recording of the Joker's laugh and possibly the old "nananana Batman!" theme song in with the bat signal like that old limited edition Joker guitar. I've been tinkering with mods for those modules... they're really cool for an added gimmick. They can be used as an onboard looper, sound effects, hooked up to trigger other fx. 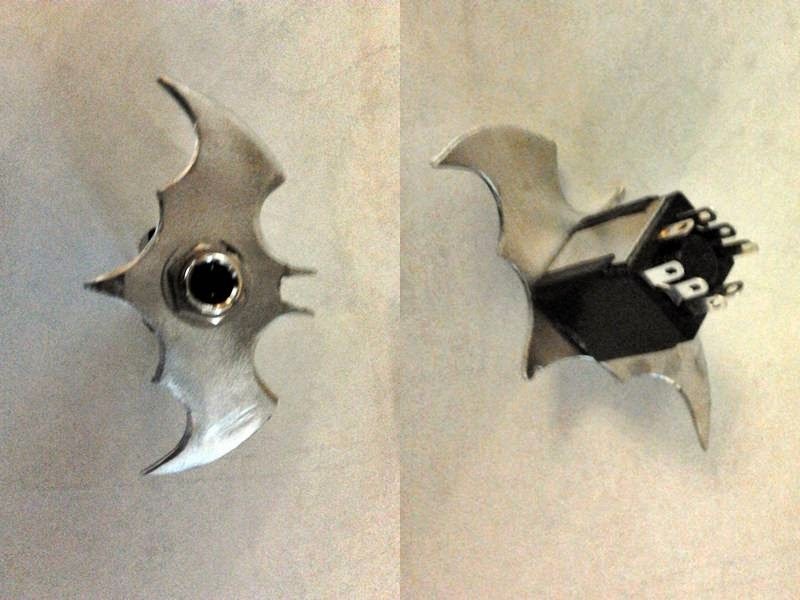 Quite nifty and usually easy to mod. The 60's batman theme would be really cool! Just hook the speaker wires to the output jack with a trim pot to keep the volume level equal. Yeah, we could have printed out some legit looking images, but I wanted authentic comics. Very cool final result though! I've heard of people using printed fabric as well! We're hoping to have it playing sweetly by the 30th May for the Gear Junkie's "Builders Day/Swop Meet" in Cpt. Wait elaborate on this swop meet thingy? It sounds cool! Chocklit_Thunda wrote: Wait elaborate on this swop meet thingy? It sounds cool! Hasn't been officially advertised (there's a Gear Junkie newsletter pending I hear) - there's a bunch of guys who are building all sorts of interesting things (Wizard, Lapdawg, Manfred, Danie & Paul Searle, amongst others) and there's quite a cool trade culture going - bits/favours for favours/bits. So we reckoned it would be cool to get em all together on the same day, shoot some footage for Gear Junkie Tv and have a chance to have everyone swop their bits and stir the pot of inspiration.